Presidential cycles have long been a driver of technology innovations. In 2008, President Obama’s “my.barackobama.com” turned thousands of activists into crowdsourced digital precinct captains, writing their own blogs, dialing voters, and competing for points as leaders in the campaign. And both the 2008 and 2012 cycles brought us new digital and analytics firms like Blue Labs, Civis Analytics, Edgeflip, Precision Strategies and many more. The top of the ticket in 2016 also birthed and nurtured new technologies, including a host of apps to mobilize the grassroots by phone and text messages, through friends, door-do-door, and by shared vehicle and housing. And while a general election loss isn’t as fertile for new consulting firms, the fierce 2016 primary fight and new Republican administration shook out something new: a decentralized, always-on movement of coders, project managers and communicators fresh from the Democratic campaigns and ready to take on establishment DC. “Progressive Coders Network,” with members collected from the Slack channels associated with grassroots pro-Bernie Sanders efforts and various other progressive technology groups associated with Hillary Clinton’s campaign and even non-partisan and international organizations, has grown into a community of hundreds of activists dedicated to building tools for movement progressives and removing big money’s influence from politics. Founder Rapi Castillo recently began dedicating his efforts to the community full time. Progcode joined OSDI after the general election, and its members are using its open framework to quickly stand up new projects and integrate the movement’s disparate tools. 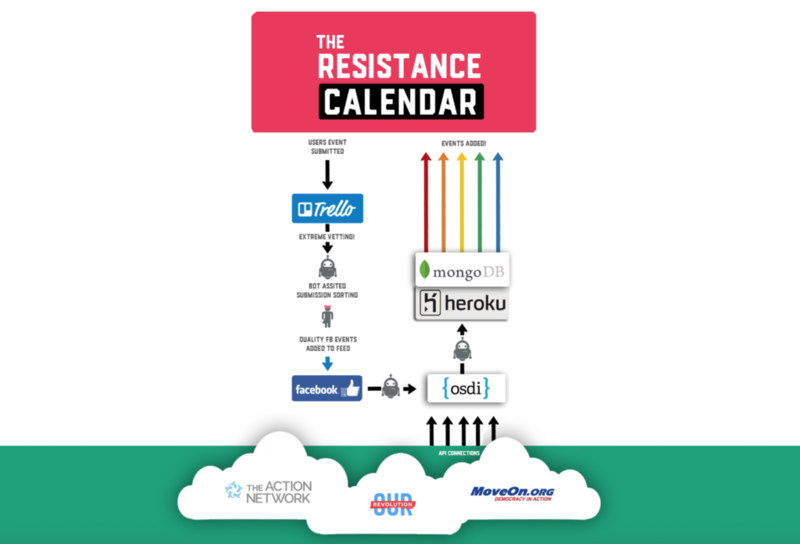 One current project by an independent member of the network is “The Resistance Calendar” which parses user submitted events from several sources into a unified resource. The group is also working on a “Maps for Change” roadmap, which includes map and events aggregation, alerts, and a single sign-on for progressive technologies. Another project working with Progressive Coders using OSDI is the “National Voter File,” which seeks to create an open source directory that authorized users can query for campaigns and other grassroots activity. “I really like OSDI,” said Castillo “The HAL Browser makes it easy for people to browse the API and allows us to provide an interoperable process for all the progressive technologies that are being built by the community, as well as progressive tools like Action Network that grassroots movements have been using. Active progcode projects are public on GitHub, and the group maintains a Slack group with scores of active channels (apply for membership here). Individual members of progcode participate in OSDI technology meetings, and OSDI members recently joined the group’s weekly hangout to answer questions. In addition to progressive vendors, OSDI members and adopters also include general technology providers such as telephony provider CallHub and data append vendor Accurate Append. Integrations using the OSDI standard typically reduce technology integrations from weeks to days. The Open Supporter Data Interface (“OSDI”), a coalition effort to define open API standards and data structures for progressive technology interoperability, is coming of age with new implementations by commercial vendors ranging from activist toolsets to data providers. OSDI began as an outgrowth of the 2012 Washington United for Marriage campaign, after proponents experienced frustrations due to a lack of interoperability between the hodgepodge of tools needed to win progressive victories. After an initial conversation instigated by Josh Cohen, the director of technology for that campaign, and campaign vendors like Amicus, OSDI has grown considerably and is now led by volunteer technologists from across the U.S., in implementer roles at nonprofits as well as management positions at technology companies including NGP VAN. OSDI’s membership includes unions, advocacy organizations, nonprofits, political strategists and vendors.